Armed Forces Day 2019 is just 100 days away, with preparations underway for the national event in Salisbury and hundreds of community events across the country. Now in its 11th year, Armed Forces Day is an opportunity for the nation to thank Servicemen and women, past and present, for their readiness to serve and protect the UK and its interests both at home and abroad. The national event will give the people of Salisbury and the public as a whole the change to thank the Armed Forces for their tireless support towards the city’s recovery following last year’s Novichok attacks. Salisbury has many current and historic links to the Armed Forces and is home to several Army bases and Salisbury Plain, one of the UK’s biggest military training areas. 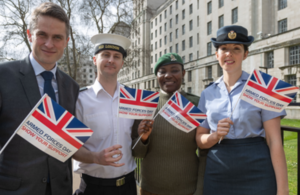 In 100 days time, hundred of communities across the UK will celebrate Armed Forces Day with street parties, parades, barbecues and tea dances.